Aero Classics Models: one limited edition collectable, die-cast metal airliner model in a 1/400th scale of a Vickers Viscount 755D in the Compañía Cubana de Aviación Original Delivery Colors Scheme. Airframe Registration CU-T604. This particular aircraft was originally delivered NEW to Cubana de Aviación in June,1956 and served in its delivery colors until sold in April, 1961. This model is constructed of die-cast metal with some plastic parts. This product is available beginning in March 2018. Vickers Viscount 755D Reg. CU-T604. 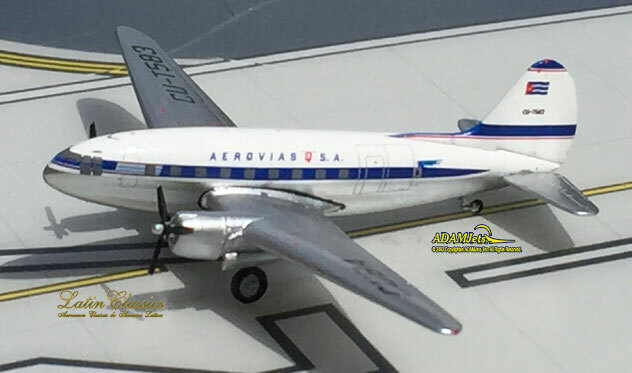 Latin Classics Models: one limited edition collectable, die-cast metal airliner model in a 1/400th scale of a Douglas DC-6 in the Compañía Aeronaves de Mexico Airlines Old 1960s Colors Scheme. With titles Moctexuma. Airframe Registration XA-NAM. This model is constructed of die-cast metal with some plastic parts. This product is available beginning in December 2017. Latin Classics Model: one limited edition collectible, die cast metal airliner model, in a 1/00th scale of a Douglas DC-9-32 in the AeroMexico Airlines early 1990’s Colors Scheme. With a Polished Metal finish. Airframe Registration XA-AMD. The model is constructed of metal with some plastic parts. This product was released in September, 2018. Latin Classics Models: one limited edition collectible, fully assembled, and highly detailed die cast airliner model, in a 1/400th scale of a Douglas DC-9-32 in the AeroMexico Airlines Old 1990's Hybrid Color Scheme. With a Painted finish. Airframe Registration XA-TFO. The model is constructed of metal with some plastic parts.This is a collectable model, not suitable for children under the age of 14 years. This product was released in January, 2019. Latin Classics Models: one limited edition collectible, die cast airliner model, in a 1/400th scale of a Boeing B757-29J in the AeroMexico Airlines Hybrid Color Scheme. With a Painted finish. Airframe Registration XA-TQU. The model is constructed of metal with some plastic parts. This product was released in November, 2018. Latin Classics Models: one limited edition collectible, die cast airliner model, in a 1/400th scale of a McDonnell Douglas DC-10-15 in the AeroMexico Airlines Old 1980’s 50th Anniverssary Color Scheme. With 50th Anniverssary Tail logo and titles Independencia. Airframe Registration N1003N. The model is constructed of metal with some plastic parts. This product was released in December, 2018. Aero Classics Models: one limited edition collectible, fully assembled, and highly detailed die cast airliner model, in a 1/400th scale of a Boeing B767-284/ER in the AeroMexico Airlines Early 2000’s Colors Scheme. With a Polished Metal finish. Airframe Registration XA-JBC. The model is constructed of die-cast metal with some plastic parts. This is a collectable model, not suitable for children under the age of 14 years. This product was first released in February, 2019. Latin Classics Models: one limited edition collectable, die-cast metal airliner model in a 1/400th scale of a Douglas DC-8-51 in the AeroMexico Airlines Mid 1980s Colors Scheme. With a Polished Metal finish and titles Jalisco. Airframe Registration XA-SIB. This model is constructed of die-cast metal with some plastic parts. This product is available beginning in May, 2018. Latin Classics Models: one limited edition collectible, fully assembled, and highly detailed die cast airliner model, in a 1/400th scale of a Curtis C-46A Commando in the Aerovias Q S.A. Airways Old 1950’s Colors Scheme. With a Painted Metal finish. Airframe Registration CU-T583. The model is constructed of metal with some plastic parts. This is a collectable model, not suitable for children under the age of 14 years. This product was first released in September, 2018. Latin Classics Models: one limited edition, collectible die cast airliner model in 1/400th scale of an Airbus A321-231 in the Avianca Colombia Airlines Current Colors Scheme. With Costa Rican Flag and Registration. Airframe Registration N570TA. The model is constructed of metal with some plastic parts. This product was released in July, 2018. Latin Classics Models: one limited edition, collectible die cast airliner model in 1/400th scale of an Airbus A321-231/W in the Avianca Colombia Airlines Current Colors Scheme. With Salvadorian Flag and Colombian Registration. Airframe Registration N692AV. The model is constructed of metal with some plastic parts. This product was released in July, 2018. Latin Classics Models: one limited edition, collectible die cast airliner model in 1/400th scale of an Airbus A321-251Neo in the Avianca Colombia Airlines Current Delivery Colors Scheme. Airframe Registration N759AV. The model is constructed of metal with some plastic parts. This product was released in July, 2018. Latin Classics Models: one limited edition, collectible die cast airliner model in 1/400th scale of a Boeing B727-2A1/Advanced in the Avianca Colombia Airlines Old 1980’s Colors Scheme. Airframe Registration HK-2151X. The model is constructed of metal with some plastic parts. This product was released in August, 2018. Latin Classics Models: one limited edition collectable, die-cast airliner model in a 1/400th scale of an Airbus A330-243 in the Avianca Brazil Airlines NEW Color Scheme. With Brazilian Flag & Registration. Airframe Registration PR-OCF. This model is constructed of die-cast metal with some plastic parts. This product is available beginning in September, 2014. 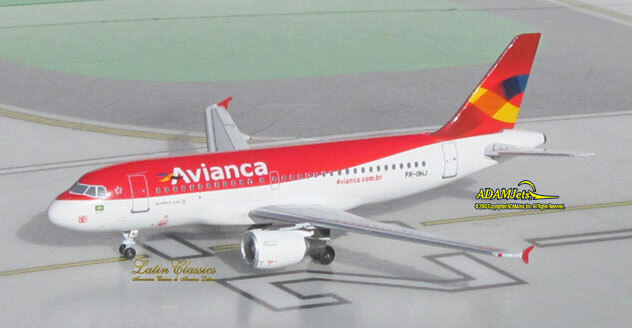 Latin Classics: one limited edition collectable, die-cast metal airliner model in a 1/400th scale of an Airbus A319-115 in the Avianca Brazil Airlines Old Color Scheme. Airframe Registration PR-ONJ. This model is constructed of die-cast metal with some plastic parts. This product is available beginning in February 2017. 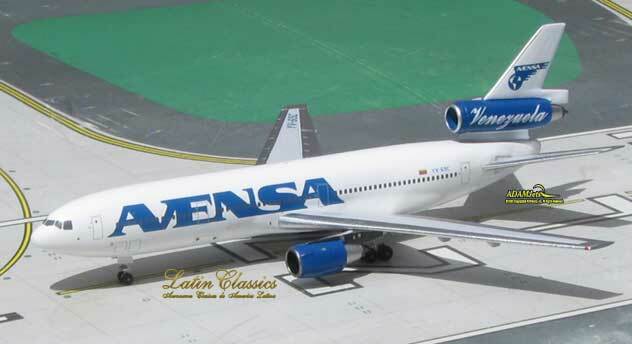 Latin Classics Models: one limited edition collectible, fully assembled, and highly detailed die cast airliner model, in a 1/400th scale of a McDonnell Douglas DC-10-30 in the AVENSA - Aerovias Venezolanas Sociedad Anónima Airlines 2000’s Billboard Colors Scheme. With a Blue Tail version. Airframe Registration YC-50C. The model is constructed of die-cast metal with some plastic parts. This is a collectable model, not suitable for children under the age of 14 years. This product was first released in March, 2019. 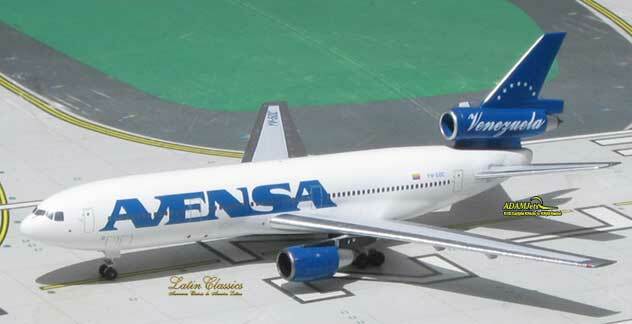 Latin Classics Models: one limited edition collectible, fully assembled, and highly detailed die cast airliner model, in a 1/400th scale of a McDonnell Douglas DC-10-30 in the AVENSA - Aerovias Venezolanas Sociedad Anónima Airlines 1990’s Billboard Colors Scheme. With a White Tail and a Blue # 2 Engine Cowling. Airframe Registration YC-69C. The model is constructed of die-cast metal with some plastic parts. This is a collectable model, not suitable for children under the age of 14 years. This product was first released in March, 2019. 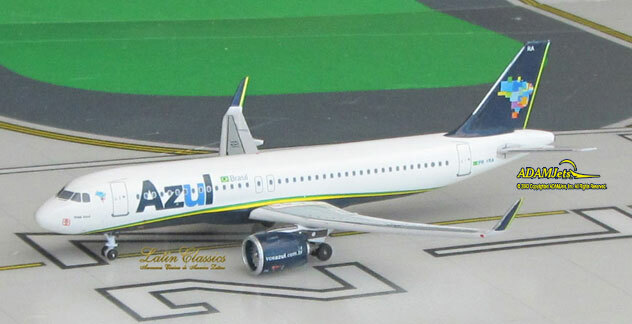 Latin Classics Models: one limited edition collectable, die-cast metal airliner model in a 1/400th scale of an Airbus A320-251/Neo in the Azul - Linhas Aereas Brasileiras Current Color Scheme. With titles Vida Azul. Airframe Registration PR-YRA. This model is constructed of die-cast metal with some plastic parts. This product is available beginning in May 2017. Latin Classics Models: one limited edition, collectible die cast airliner model in 1/400th scale of a Douglas DC-9-31 in the Aerocaribe Airlines Old 1990’s Colors Scheme. With titles Yucateca. Airframe Registration XA-ABQ. The model is constructed of metal with some plastic parts. This product was released in July, 2018. Latin Classics Models: one limited edition collectable, die-cast metal airliner model in a 1/400 scale of a Boeing B727-276/Advanced in the Aviacsa Airlines Old 1990s Colors Scheme. Airframe Registration XA-SMB. This model is constructed of die-cast metal with some plastic parts. This product is available beginning in April 2018. Latin Classics Models: : one limited edition collectible, fully assembled, and highly detailed die cast airliner model, in a 1/400th scale of a Boeing B737-9Max in the COPA Airlines 2018’s Delivery Color Scheme. With MAX 9 Billboard titles. Airframe Registration HP-9901CMP. The model is constructed of metal with some plastic parts. This is a collectable model, not suitable for children under the age of 14 years. This product was first released in January, 2019.